Throughout the Middle East and the Mediterranean, you'll encounter a variety of dishes which pair okra and tomatoes. In this Moroccan tagine recipe, zucchini is added to the mix, providing complementary flavor and an alternate vegetable for those who may not be wild about okra. Okra tagines are commonly prepared with beef or lamb; chicken may be used instead but you'll want to reduce the liquids and adjust cooking time accordingly. Many people prefer baby or young okra; if using larger, longer pods, you can cut them into small pieces but leaving the pods intact allows for nicer presentation and reduces the amount of mucilage released. The gelatinous mucilage acts as a natural thickening agent, but some find its consistency to be unpleasantly slimy. Soaking the okra in a water and vinegar bath helps reduce that effect. In Morocco, you'll hear okra referred to as . That term can be confusing, as elsewhere in the Arabic speaking world the same word is used to refer to a mallow-like green which also releases mucilage when cooked. Cooking time is for a pressure cooker. Allow double this time if cooking in a conventional pot and triple this time if slow cooking in a tagine. Serve the tagine with crusty Moroccan bread (khobz) for scooping up the meat, sauce and vegetables. Also try Fez Style Shrimp, Beef and Okra Soup and Moroccan Tagine with Peas and Okra. Trim the stem and tip from each okra pod. Remove fuzz from older, larger pods by gently scrubbing under running water. Wash and drain the okra, then place in a bowl and cover with one cup of water and one cup of vinegar. Set aside to soak for 30 to 60 minutes. Drain and pat dry thoroughly when ready to use. Trim the stem from each zucchini and partially pare by peeling several thin strips from the length of the zucchini, creating a striped effect. Smaller zucchini may be left whole; larger zucchini may be cut in half lengthwise. Set aside until ready to use. Peel, seed and finely chop the tomatoes or seed and grate them. Set aside. Over medium heat, brown the meat, onion, garlic, oil and spices in a large pot or pressure cooker. Add the tomatoes, parsley and cilantro. Cover and simmer for 10 to 15 minutes. Add 2 1/2 cups to 3 cups of water. Increase the heat and bring to a boil. If using a pot, cover, reduce heat and simmer for 60 to 90 minutes, until the meat is nearly done. If using a pressure cooker, cover and cook with pressure for about 30 minutes. Interrupt the cooking to add the okra (and a little water if necessary). Cover and bring back to a simmer for about 20 minutes (or bring back to pressure for about 10 minutes), until the okra is tender but still holds its shape. Add the zucchini and continue simmering, partially covered, until tender. Reduce the sauce until thick. Arrange on a serving platter or tagine and serve. In a large tagine placed on a diffuser over medium-low to medium heat, saute the meat, onions and garlic in the oil, turning the meat several times to brown on all sides. Be careful not to burn the garlic. Add the tomatoes, herbs and spices. Stir to combine then cover. Once simmering, cook for 10 to 15 minutes. 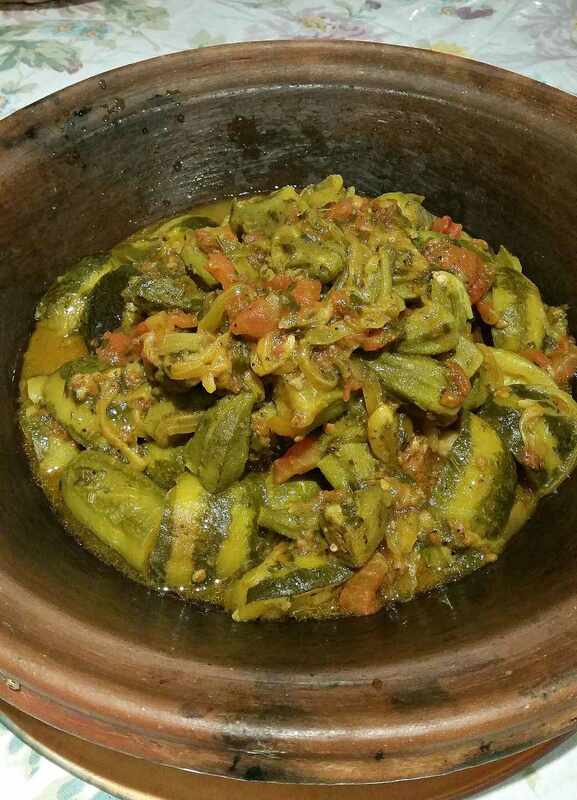 Position the meat in the center of the tagine and arrange the okra and zucchini all around. Add 1 1/2 cups of water, cover and allow the tagine to slowly reach a simmer. Continue cooking without stirring for about 3 hours (lamb may take longer), adding a little more water if needed, until the meat is very tender and the sauce is reduced. Serve the dish directly from the tagine Tradition is to eat communally from the tagine, using pieces of bread in lieu of utensils.